Zikodrive Motor Controllers (both stepper motor drivers and brushless motor controllers or ESCs) are especially well suited to pump applications and broader process control applications. We work with a wide range of pump manufacturers from peristaltic to diaphragm and gear pumps and we understand what’s required to get the best possible performance from a broad range of pump types. Whether you’re looking for a basic ‘off the shelf’ stepper driver to get your peristaltic pump moving or you’re a pump manufacturer who needs a customised brushless motor controller designing and manufacturing to fit inside a gear pump, we can help! Constant speed under variable load. User selectable features (for example microstep resolution on stepper controls or current settings). Fully programmable either by user or in factory as required. Customised layout / envelope design to fit perfectly with other features in the pump. Interfaces to a range of communications protocols as required. Interfacing with a range of signal inputs relevant to pumping (for example flow meters to control speed). Perfectly optimised for the motor being used in the application. Optional further outputs (for example to control a solenoid or other relevant parts of the design). Our aim is to deliver the perfect motor controller for the pump that you are using – whether this be possible with a stock item or a modified or bespoke design controller. We want to deliver perfect performance, robust construction and long life. We know what it takes to get the best out of motors. Together with your knowledge of pumps, this means that we know how to get the most out of your pumps. Whether it’s optimising a sensorless brushless motor to deliver the most efficient performance possible or carefully optimising the current and microstep settings on a stepper motor controller, we can help. Our range of stock motor controllers can all be optimised for the motor of your choice. We’re passionate about delivering the performance you need, when you need it. In combination with a range of communications protocols and potential user interfaces, we think this enables us to offer you a powerful motor control package capable of maximising the possibilities of your pumps. Temperature monitoring (including external temperature monitoring inputs to directly monitor motors or batteries). Maximum power point tracking for solar inputs (aimed at finding the optimal voltage/current crossover point from a changing solar panel output). Of course, if your application required any other features these can also be incorporated at the design stage. Please contact our team to discus your requirements if you feel that there is something that you would require but is not mentioned here. We offer a wide range of options for peristaltic pumps but by far the most common is the use of stepper motor controllers and stepper motors to direct drive the pump. Our standard range currently offers up to 1/128 microstepping delivering exceptional dosing accuracy as well as reduced noise and smoother performance. 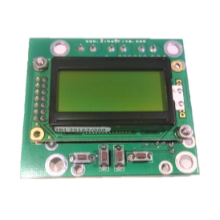 We also offer the ZD10LCD stepper motor controller with built in user interface which is perfectly optimised for perisaltic pumps and can be supplied pre-programmed with our pump settings on. If interested you can find out more about pump mode on the zD10LCD here. Easy user dosing calibration – run the fluid through, measure dosed, input the data and the system will calibrate enabling easy repeat dosing. Simple run mode with speed and run time selection. Analogue input mode for easy use with external controllers. Beyond the ZD10LCD we offer 2 main stock stepper motor controllers for peristaltic pumps. These are the ZDSP 2A controller and the ZD10 stepper motor controller. Both units are used widely with a range of pumps and motors from NEMA 11s up to NEMA 23. We regularly carry out bespoke design projects in the perstaltic pump market, delivering tailored solutins for a range of customers around the world. 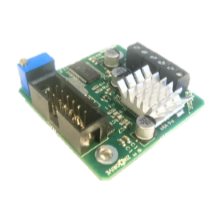 To that end, if there is something that you would be interested in pursuing, please have a look at our bespoke motor controller design page and request a quote. As you are most likely aware, brushless motors offer huge benefits over brushed DC and AC motors, especially in pump applications where weight and energy efficiency can be hugely important. We offer a wide range of brushless motor controllers for pumps including sensorless, sensored, trapezoidal and sinusoidal designs. This is also our most common area of bespoke motor control design so we have a wealth of experience in getting the right controller for your pump. Constant speed option (sometimes referred to as speed governing or constant speed under variable pressure). Safety cut outs (temperature, over current, under voltage). Optional sinusoidal, trapezoidal, FOC control. Optional 2 or 4 quadrant control. Possible integration into existing cases. If you are unsure on the best option for your particular pump then please contact our team to discuss your requirements, they’ll be happy to work with you to get you up and running in the quickest possible time. Need a range of programming options to meet different customer's requirements? No problem! For larger customers we can setup a motor controller that enables you to quickly and easily install a range of programming options onto the same hardware. Our team can come out and visit you, setup the required software and then show staff how to programme and test units. The process is quick and easy to learn and carry out and can provide a huge range of options for different pump models and different customer requirements. This is true of both our standard range of controllers (both brushless and stepper) but also of any new custom designs we might carry out for you. Equally, if programming is not what you want to be doing and you have customers who require a quick and easy way of making changes themselves then this is something that we can also implement. 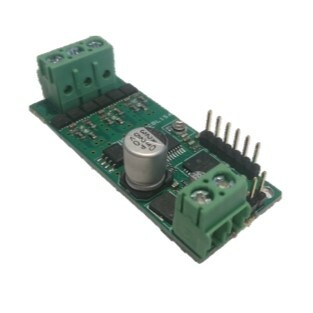 Whether it be dip switches, solder pads or an external programmer unit which can eb quickly plugged into the controller and used to set parameters, we are happy to develop this for you. If this sounds like something that would interest you then please get in touch with us to discuss your requirements. We've used DC motors for some years and are looking to change these for something more efficient and with more control - what would you recommend? When changing from DC motors to brushless or stepper motors it is really important to understand the specific nature of the application and pump performance. In general we would suggest that you have a look at our main frequently asked questions section which has several articles on this subject or if you’d rather get in touch with us directly we would be happy to help. What motor type is best for what pump type? Broadly speaking it depends on the RPM you are looking to achieve. At low RPMs (<600rpm) stepper motors will have much more control and will deliver a much smoother performance. At higher RPMs (>600rpm) it is likely that brushless DC will deliver more efficiency and better performance. I like the idea of a customised controller but I'm not sure our volumes are high enough to make it cost effective? Generally speaking customised controllers become seriously cost effective once you go over the 1000 units/year mark. However, that said, we have a number of customers who we have saved money who take approximately 200 units/year. As with a lot of the factors involved, it really does depend on your specific project so we would always encourage you to get in touch with us to have a discussion as to how we might be able to help. Why should I use a Zikodrive Brushless Motor Controller when I can get a simple brushless ESC for a lot less money? Ultimately, it depends on the functionality that you require from the pump. 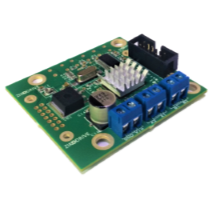 If all you need is a simple run programme that starts as soon as voltage is applied with a relatively low life span then there is probably little point in using a Zikodrive brushless DC motor controller. Additional safety protections to protect the user, wider system, pump and controller. Longer life. Better build quality and design as well as in built safety mechanisms ensure long life. Improved performance options. Our controllers can be tailored to meet whatever performance requirements you have, whether it’s tailored speed range, constant speed, smooth startup, starting under load or anything else. If you’re not sure, please contact us to discuss your motor control needs. Comprehensive Customer Service. We will work with you to ensure the controller delivers the performance you need. Whether it’s remote tech support to help get support, onsite technical support or just email support you can be certain you’ll get the help you need. I need a stepper motor controller but I'm not sure what features I need. Well, the quickest option would be to give us a call to discuss your requirements. However, if you prefer to read a bit more about it before giving us a call then you can. We regularly add new information to our FAQs and ZikoUniversity pages to try and help prospective customers find out what the best option is for them. We also do our best to man our online chat system from our UK office so if that is online then you can always ask us there. What is the best option for dosing applications? It depends on the specific nature of the dosing application. For low volume it is nearly always best to use stepper motors and controllers as these provide much more positional accuracy. However, if the system is required to dose in higher volumes then stepper motors may not be able to deliver the volume required. In this case a brushless DC motor and controller can be a good option. You can find out more about dosing with brushless DC motors and controllers here – there are several potential methods that can be used. In addition to this there are further benefits to be had from exploring using a geared brushless DC motor and controller. For more information on this it is usually best to get in touch with us to discuss your specific requirements so that we can then make an informed recommendation. We can provide any of our stock motor controllers as ‘own brand’ or white label motor controllers. This incurs a small retooling charge and will have to be quoted accordingly. Click here to find out more about own brand motor controllers and to request a quote for the units you need.